Huber's Butchery in Dempsey Hill has moved to bigger premises in the same area and now occupies two shopping floors in a standalone building that used to be Carnivore restaurant. Its adjoining bistro has also expanded and is now in a smaller building next to the shop. It not only serves lunch now, but dinner too. The original small menu of salads, sausages, burger and steak will be expanded soon to include soups and pork and lamb main courses. In the meantime, you can get a pretty decent steak for $28. The 220g US Prime Sirloin Steak may not have the flavour of a prime cut in a fine-dining restaurant, but is certainly better than most similarly priced steaks around town. The Huber's Beef Burger With Bacon & Gruyere Cheese ($15.50) is good too, with a thick 170g beef patty that is juicy and cooked just right. But the caramelised onion in the burger is a bit too sugary for me. And if you feel like continuing your meat feast at home, pop into the store. There is a huge array of raw meats, some marinated. I got a freshly made Kurobuta sausage with wasabi that was a treat for breakfast the next day. The former Olive Tree buffet eatery at the InterContinental Singapore hotel has been transformed into restaurant Ash & Elm, with a menu that morphs from buffet breakfast to semi-buffet lunch and a la carte European at lunch and dinner. Dinner is the most interesting, as various live stations around the restaurant fire up into activity centres for pizza baking, meat grilling and dessert plating. The restaurant also has an impressive charcuterie area where it makes its own pastrami, smoked meats and various cold cuts. Check out the Ash & Elm Sharing Platter (from $24) for a selection of what is on offer. Big groups can also get the Beef Tasting ($108), comprising USDA New York Striploin, Australian Rib-eye and French Bavette d'Aloyau, for a taste of different steaks grilled over charcoal. And for dessert, the Chocolate-Hazelnut Pizza ($24) is an interesting concoction of chocolate brioche topped with dark, milk and white chocolate, praline and marshmallow. It is served with cocoa granite and white chocolate ice cream. Seafood takes the spotlight at Jia Wei Chinese Restaurant this month with set menus of dishes whipped up by chef Victor Li, who joined the restaurant earlier this year. The sets range from $198 for four persons to $448 for 10 for seven courses. You choose one dish from each category of seafood such as prawns, fish, crab and clams. Dishes include Baked Sea Bass With Whole Garlic In Opeh Leaf, Black Pepper Crab With Chinese Buns and Stewed Sea Clam With Luffa Melon In Spicy Sour Soup. The Malaysia-born chef also does a mean Kuala Lumpur-style fried Hokkien mee, with its characteristic thick noodles and inky sauce. The version here is a bit more deluxe with seafood such as scallops, big prawns and clams. But the taste is authentic and it has that essential ingredient - crispy lard bits. It is not part of the seafood set menu, but is in the promotion's a la carte menu at $24. Hashida Garo's original concept of a Japanese dessert shop in an art gallery setting has expanded to include a good selection of main courses in its menu. Most of them are bento sets that include a salad or cold starter, rice and soup. A popular item is the Chicken Karaage Set ($25), a substantial meal of deep-fried chicken thigh, shredded salad, chawanmushi, pickles, rice and miso soup. The Unagi Ippon ($27.90) has grilled eel, shredded egg and seaweed served over rice and accompanied by pickles and miso soup. If you are in the mood to splurge, there is a Miyazaki Wagyu Set ($90), which comes with wagyu A5 tenderloin, potato salad, rice, pickles and miso soup. The meals come with wagashi or sweet of the day. 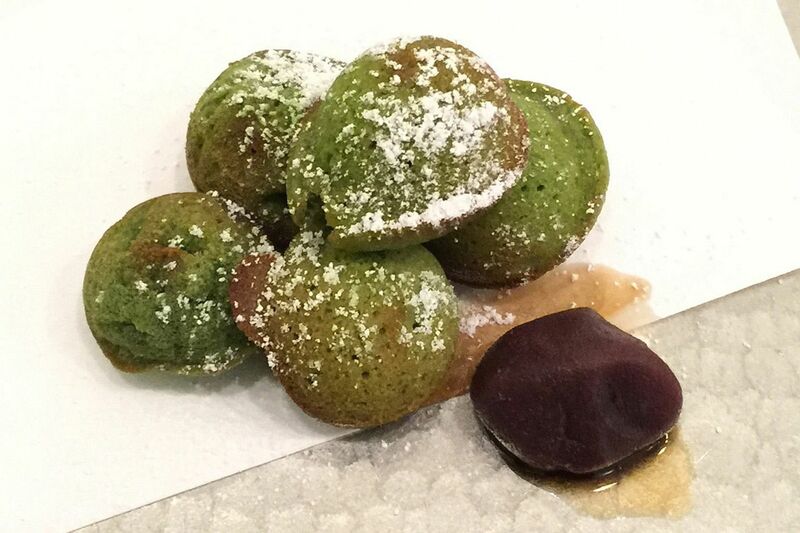 My favourite is the Matcha Financier ($6), little fluffy pastries that burst with flavour in the mouth. If they do not come with your set, order them. Book a meal at Ash & Elm with Chope.